Reservation has a very bad effect in today's world. It is stuffing people with jealousy and creating inequality between the people of different casts. This caste based reservation system should be abolished now. This reservation system is filling the hearts of Indians with revenge by the method of violence, which is not good. At starting reservation on the basis of caste acted like boom to the society but now it is only harming the people and creating differences between them. Today nobody believes in caste but this caste based reservation system is forcing the people to believe in it. In India there are many people who belong from general category and are very poor, what will they do. This reservation based on caste should be given to those who really need it, not to the people who belong to particular caste. When we are children then we don't know much about this reservation system and we don't think it of. We are only friends of one category but when we grow up we see different seats are reserved for different categories like SC, ST etc. At that time our friendship breaks and we start thinking of reservation. This start making differences among Indians. This is a big effect of reservation. 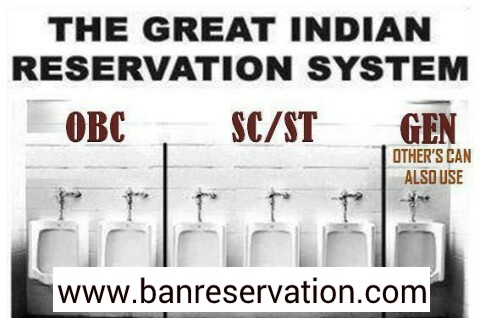 If this reservation system is completely removed then our coming generation will not think about it and there will be equality among all the Indians. Soon the time will come when reservation word will vanish from our India and all the Indians will live peaceful life in equality. This reservation acted like boom for 10 years, when this reservation system started but now it is a curse on our society and people. Those who wanted to progress they did in starting only. Now the reservation is the method for the political parties to fill the votes in their vote banks. They are afraid that if they removed this reservation then they will not get votes from the categories who were given reservation. Reservation became profit and loss statement for politics today. This reservation system will led to violence in coming days. And we will not get any solution. Government should thing about this matter as it is a serious issue. The coming future with reservation is dull and black for our growing country. Strict action should be taken against is reservation and in favor of general category people. Today make no relation with different category people and this is creation inequality among people. This is a big problem now a days. What is the benefit of reservation if it is dividing us, creating inequality and leading to violence among each other? It is having only and only bad effect. So action must be taken. READ AND SHARE IF YOU AGREE WITH ME. CONTINUE READING IN OTHER POSTS OF ME.